The wire cut represents an essential operation in most metallic wire machining processes. Cometo products range offers two different sizes of equipment for the wire guillotine cut for diameter range going from 0,5 up to 12mm, suitable for different cutting conditions and materials. The guillotine cut means the equipment temporary stops allowing the cut execution, and starts-up immediately after. 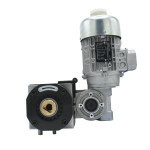 Both units can be supplied with different driving types according to the specific requirements.